What’s great about the criminal justice system is that there are so many opportunities to do arts and crafts! Between police sketches, courtroom artists, and whoever is in charge of drawing those chalk outlines, there’s a wealth of opportunities for the creatively inclined (though if you ask me, chalk outline artists are cheap frauds because that’s just glorified tracing). 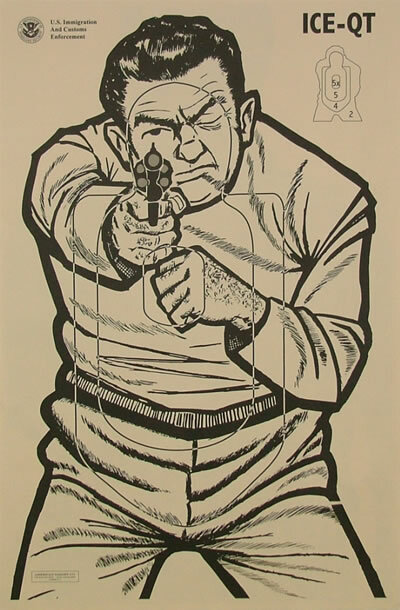 If you ask me, the best art gig in that realm is whoever is in charge of drawing those paper shooting target things. Not only is your art screened in “galleries” across the world, but you can be a petty passive aggressive monster and put whoever you want on there! Someone rear ended you in traffic? Make a target out of them! Someone didn’t invite you to their birthday? Make a target out of them! Neighbor’s dog crapping on your lawn? Make a target out of the dog! I’m sure people will love that. He will be a king in prison. He can slip through the bars and stage a prison riot. And he’s a piece of paper so … you know … nothing weird will happen after lights out. No one is going to risk a paper cut … there. Actually, it’s a gray box with a lego-like brick and “Activate Adobe Flash” in it. And so begins Axel’s descent into madness as he attempts to find every worm. That is God Slug, my friend. People say I’m pretty good at chalk outlines.